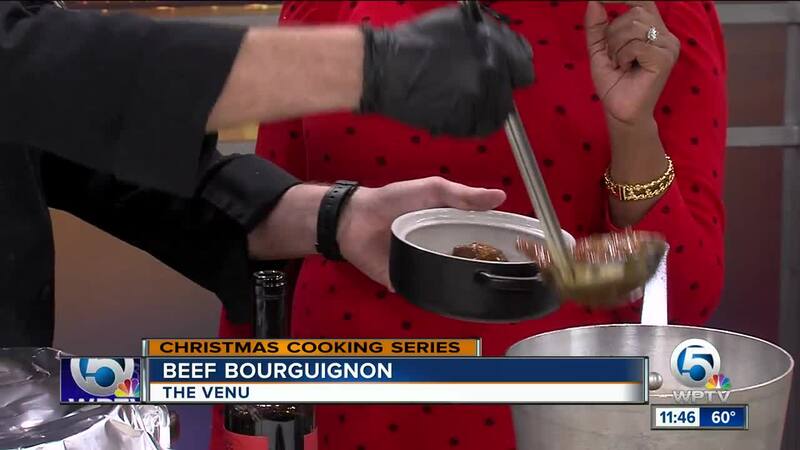 Chef Kelley with The Venu restaurant cooks Beef Bourguignon. 3. Heat oven to 350 degrees. Raise heat under pot to medium-high and cook until fat is starting to smoke. Lay half the beef cubes in a single layer in the pot, leaving space between pieces. Cook until well browned on all sides, 10 to 15 minutes; transfer pieces to a plate as they brown. Repeat with remaining beef. 4. Stir in onion, carrot and remaining 1/4 teaspoon salt and cook until soft, about 10 minutes, stirring occasionally. 6. Meanwhile, in a large skillet set over high heat, combine onions, mushrooms, 1/4 cup water, the olive oil and a pinch each of salt, pepper and sugar. Bring to a simmer, then cover and reduce heat to medium, cooking for 15 minutes. Uncover, raise heat to high, and cook, until vegetables are well browned, 5 to 7 minutes. 7. Scatter onions and mushrooms and rest of cooked bacon over stew, top with parsley.